This game looks flippin’ awesome! 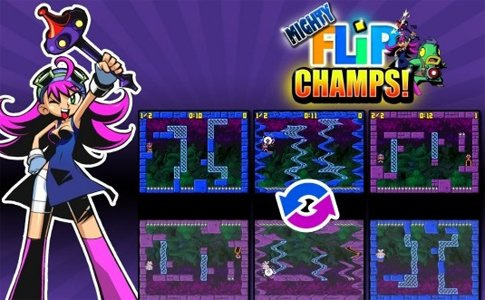 If you read our recent interview with WayForward about their upcoming DSiWare game, Mighty Flip Champs! if you are anything like us you probably put this game right on your “instabuy” list. It certainly looks set to be the first DSiWare title to try and bring something original to the table. Flipping between alternate dimensions seems like a brilliant way to make use of the DSi’s dual screen and we have to say we are digging the NES style graphics too. 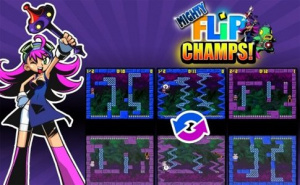 Stayed tuned to Nintendo Life for the very latest Mighty Flip Champs! news. This is certainly one of the best looking DSiWare games I've seen. Agreed Damo... this is a definite download for me. Hopefully since this is on the Nintendo Channel, it'll be coming very soon. I really hope this is 500 points, since I still have that many left from when I got my DSi yesterday. I wouldn't be surprised if it came out for 800(+) points, but it just means I wouldn't be getting it for a little while. Well, maybe. I need a DSi. Well I might as well buy this one too, i purchased all the DSiWare xD and they where crappy. Now this is more like it. This is the type of originality I was hoping we'd see on the DSiWare service. WayForward seem to be a perfect fit for the WiiWare and DSiWare services. I hope they continue to support them even after they begin releasing retail titles. Yes! This game looks awesome! WayForward Rocks! I have to consider getting a DSi just so I can experience this game! Now that WayForward has been getting more attention with this game and the forthcoming A Boy and His Blob maybe they can start work on Contra 5 and Sigma Star Saga 2! @WolfRamHeart: Umm...and Shantae. You forgot Shantae. Also, I want Voldi Way's title. "Tyrannical Overlord" sounds SO much cooler than "Game Adviser." Oops, sorry I forgot Shantae! I actually never played it before but I heard nothing but great things about it! I'm sure I would like that too! Not a big fan of the art direction in this game- but the gameplay looks fun as hell! Looking forward to trying it out. @WolfRamHeart: That's better! I think that Shantae was released at the COMPLETELY wrong time. It was before weird styles became an accepted concept (people saw the box and thought "eew...dumb little girl game! "), and being the LAST GBC game released certainly didn't help. I predict that a new Shantae title on DSiWare would do exceedingly well, partially due to the growing fanbase which includes those who've never played the original, and partially because of the current gaming climate and relative cheapness the release would have. Just everybody buy this game, and maybe they'll be able to do it! I'll buy a DSi for this as soon as its released. Great gameplay by the looks of it, but for some strange reason it doesn't grab me yet.